This is probably the commonest cause of coccidiosis in chickens and occurs worldwide. 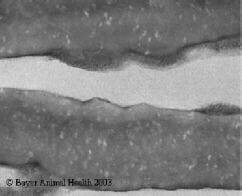 It is seen in layers and in broilers, both alone and in association with other species of coccidia and is caused by Eimeria acervulina, which is moderately pathogenic. Morbidity is variable and mortality low or absent. Eimeria mivati is currently considered not to be a valid species distinct from E. acervulina. Thickening, and other lesions, restricted to upper third of small intestine - the duodenum and part of the ileum. White spots or bands in the mucosa. In severe infections they become confluent and cause sloughing of the mucosa. A system of assessing the severity of coccidial challenge by attributing a 'score' is often used. A detailed description is beyond the scope of this book. In general terms a score of 0 indicates no lesions and a score of 4 indicates maximal severity of lesion or death. Various publications provide a photographic key to severity of lesion. Signs, lesions, microscopic exam of scrapings. Differentiate from necrotic and non-specific enteritis. Toltrazuril, Sulphonamides, Amprolium, in feed or water. Coccidiostats in feed, vaccination by controlled exposure, hygiene. Immunity is quite short lived (about 30 days) in the absence of continued challenge. Figure 12. Moderate Eimeria acervulina infection (score 2) in chicken duodenum. In milder infections there may be scattered white spots, in severe the entire surface is pale or denuded of epithelium.